Swift is Apple’s new programming language which capable of creating iOS and OS X apps and looks to replace Objective-C as the main language for app development on Apple’s platforms. Swift code is 75% faster than Objective-C, the main programming language used by Apple since the early 90′s. Swift will use the same LLVM compiler, runtime, and libraries as Apple’s Objective-C implementation, so developers can mix and match Swift and Objective-C code in the same app. Writing app with Swift programming language is easy enough, users no need to set up a main function, or import references. 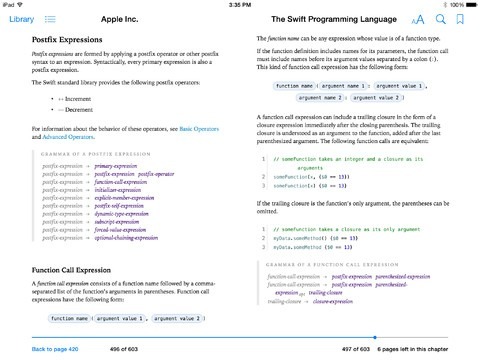 Besides releasingSwift programming language, Apple has also giving away The Swift Programming Language e-book on iTunes. This book provides a tour of the language, detailed guide delving into each language feature, and formal reference for the language. The Swift Programming Language is available for download with iBooks on Mac or iOS device, and through iTunes on PC. Books can be read with iBooks on your Mac or iOS device. For more information, check out the link below to download The Swift Programming Language e-book on iTunes.